Miami and Chicago revive the 90s with "punches" and knocks down the middle. Or rather the cry that has been linked to professional wrestling: "Let's get ready to rumble"! "Let us prepare for a fight," So! In the second game shared 9 Technical fouls and expelled two players. The third match was eliminated ... Only one, but the Bulls and Heat "went" series to another level. The two teams do not really like each other and showed just before the jump ball. Players the Bulls and the Heat did not exchange even a handshake before the start of the race, something that does not happen too often in the NBA. Almost ... never for accuracy. Not for at least one game. "No we love one another and it shows on the court," said Taj Gibson, one of two players (along with Noah) expelled in the second race. In the third, however, there were several occasions to fight. 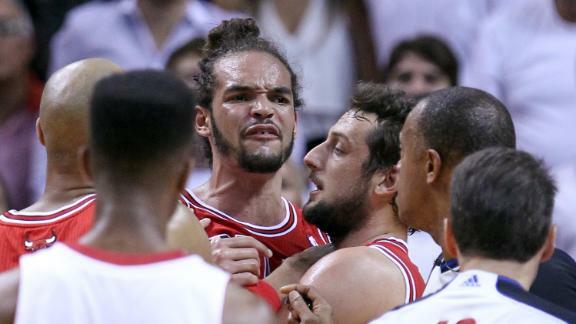 Pushing the Joakim Noah to Chris Andersen (to help him get up Nate Robinson), the strong shove of Nazr Mohammed who laid his LeBron James on the court, even the incredible move Noah to ... applaud their Chalmers, Bosh while disagreeing strongly (!) were snapshots threw some more fuel to the fire. At the end of the match, however, pushing the Nazr Mohammed in LeBron James was at the center of all ... "A push should not be punished by expulsion, that he threw down was a sneaky hit" professed by Nazr Mohammed to issue phase, while Tom Thibodeau spoke flopping (of LeBron) and Nate Robinson emphasized his words coach saying: "You've seen LeBron in many commercials, is a good actor." The rift between the two specific groups, of course, did not begin nor yesterday, nor in the second game of the series. It has deeper roots which lead us on March 27, the day ie the Bulls stopped his winning streak in Miami at 27-0, eknefrizontas champions with hard play. The players at the Miami then left the stadium frustrated without shaking hands with the hosts, while foul like ... hugging Kirk Hinrich to LeBron James or another of Taj Gibson in "King", prompted the MVP of the regular season to refer to arbitration after the race. In essence, witnessing the tougher series of this year's playoffs, not th and the last 20 years. After three games have expelled three players have shared 12 Technical fouls and have been designated a total of 145 fouls (48.3 per game)! To do and the necessary comparisons with what we've seen so far in 55 games conducted until this year, take a look in the table below. Αναρτήθηκε από Unknown στις 7:57 π.μ.